Excellent Fitting and Grip as per Indian Fit Sizes. Equipped with smooth texture design for better comfort and offers higher strength. Superior grip and fitting so as to avoid sudden drop-offs. It is sweat resistant and really easy to wear for long working hours. 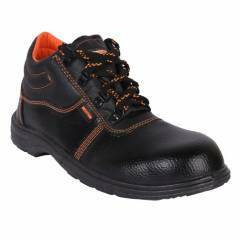 ordered this safety shoe last week and received in 3 days. The product was nicely packed and was brand new. The shoe is decent and seriously at this price point it is the best.